No Back Plate? No Problem! 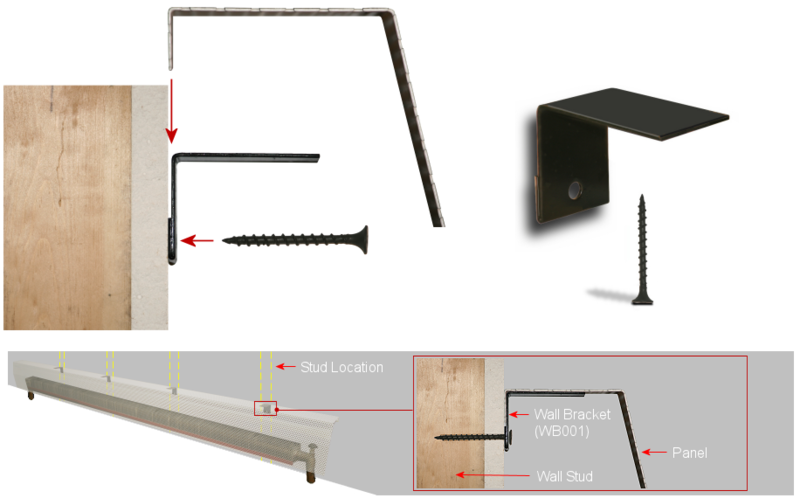 Our Wall Bracket supports the baseboard cover in cases where the original baseboard assembly has been completely removed from the wall. All that remains would be the copper pipes and fin tube elements. By simply attaching the wall bracket(s) as shown in the photo, you will be able to securely support your new baseboard heater cover. This solution allows for the placement of our baseboard heater covers virtually anywhere regardless of the condition of the pre-existing baseboard covers. This baseboard cover wall bracket comes painted in powder coated black. How many wall brackets do I need? Typically we recommend two Wall Brackets for lengths under 4 ft and three Wall Brackets for any length over 4 ft. Ensure the wall behind the baseboard heater is patched and painted up to 8″ above the finished floor. Locate the nearest stud (or some solid material behind the sheetrock) at both ends of the heater. To make the job easy, locate and drill a pilot hole 7″ above the finished floor. This is only a recommended height. Ultimately you can decide how high to mount the panel. (Do not use Premium Tall as the taller profile will never be applicable in this situation). Using the screws provided, secure one wall bracket at each end of the heater. Use a third in the middle for additional support and for 6′ and 7′ lengths. The wall bracket will produce a thin gap between itself and the wall. This gap will receive the lip on the back side of the baseboard heater cover panel as illustrated.